We'd love to hear from you. Comments, feedback, suggestions...it's all welcome. 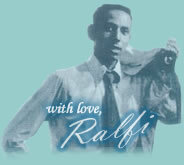 Don't forget to visit our message forum to discuss Ralfi Pagan with others.